The 2010 earthquake in Haiti left two million people homeless and destroyed the country’s infrastructure. Seven years later, more than 60,000 people are still displaced and deprived of adequate protection or services. 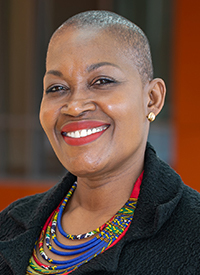 Carolann L. Daniel, Ph.D., associate professor of social work at Adelphi, is determined to develop guidelines that reduce the risk of violence for displaced youth in Haiti. Dr. Daniel explores the everyday violence faced by young men and women living in temporary tent structures—from sexual assault and intimate partner violence to unemployment and food insecurity—based on individual interviews and focus groups. Inadequate housing has made young women particularly vulnerable to gender-based violence, heightened by deep-rooted poverty and ongoing civil and political conflict. To combat these challenges, Dr. Daniel calls for increased employment opportunities for young people, the construction of shelters and safe housing, and programs to reduce gender inequality and vulnerability to HIV and other sexually transmitted diseases. » Learn more about Dr. Daniel’s work. May 3, 2016 Treating Trauma By Identifying its Sociopolitical Roots News Assistant professor Laura Quiros, Ph.D., researches how trauma is often the root of failed treatment plans and relapse of substance abuse.